This is one thick 280-page artbook for fans of the Ys video game series. The original book is the Japanese edition イース THEアートブック released in 2013, and this English edition is from Udon. There are lots to see considering that they packed artworks from the first game that released in 1987 to the latest one in 2012 which is Ys: Memories of Celceta. Below's the full list of games included and it seems they left out Ys IV. It's quite interesting to see the evolution of the game art over a period of two decades. They started out with traditional media art, then moved into digital painting, and the most recent ones have more anime style colouring. In essence, it's a character design book. It feels like there are over a hundred characters. Miscellaneous art such as locations, props are few. Illustrations are wonderful. There are standalone character art, splash pages and some story scenes. There aren't any commentary except for notes beside some artworks. Since the games are from so long ago, and there aren't any game summaries, you probably have to go to Wikipedia to get your memories refreshed. 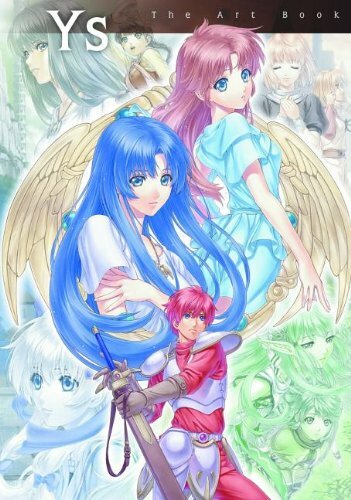 Overall, it's a fantastic collection recommended to all Ys fans.